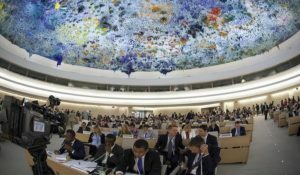 Morocco’s Permanent Representative in Geneva, Mohamed Auajjar, once again found himself forced to set his Algerian counterpart straight, following the latter’s repeated maneuvers aimed at deflecting the debates of the UN Human Rights Council, by his biased remarks on alleged human rights violations in the Moroccan Sahara. The repeated failures of Morocco’s opponents to influence the Office of the High Commissioner for Human Rights on the Sahara issue do not seem to have deterred Algeria from orchestrating an umpteenth desperate campaign about imaginary violations of human rights in the Moroccan southern provinces. During the discussions of the HRC on the follow-up of the implementation of the Vienna Declaration and its Plan of Action, the Moroccan diplomat deflated all Algerian allegations. He recalled “the positive interaction” of the Kingdom with the provisions of the Vienna Declaration, which, he said, “proceeds from its voluntarist policy and national strategic choices in favor of the consolidation of democracy, the strengthening of the rule of law and the defense of human rights and fundamental freedoms”. He also underlined Morocco’s unwavering commitment and its active role in the HRC as well as its close cooperation with the Office of the High Commissioner for Human Rights and the various UN human rights mechanisms. “The dynamics of the pioneering democratic reforms initiated since the mid-1990s in Morocco benefits all regions of the Kingdom, starting with its southern provinces,” he noted. Since the return of these provinces to the Motherland in 1975, local democracy has been steadily promoted and the involvement of local populations, civil society and local elected representatives expanded, he said. The Moroccan diplomat mentioned as an instance the turnout in local and legislative election that is always higher in the southern provinces than in other Moroccan provinces. The Sahrawis’ involvement in public life reflects their strong commitment to their Moroccan citizenship and to the Morocco-proposed autonomy plan, described by the UN Security Council and major world capitals as “serious, credible and realistic” since it was put forward 2007, he said.